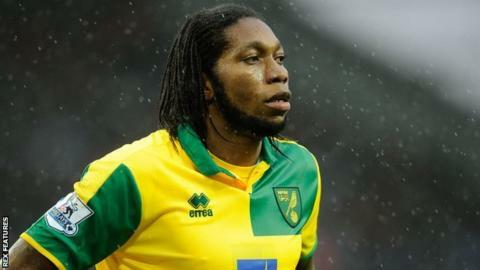 Norwich City striker Dieumerci Mbokani says his wife saved his life after they were caught up in Tuesday's explosions at Brussels International Airport. More than 30 people died in attacks at the airport and a metro station. Mbokani was scheduled to travel to DR Congo and link up with their national team. He was outside the airport when his wife said to wait for the girlfriend of his cousin. "There are miracles," he told La Derniere Heure. "We were on the pavement outside the building. I was near the taxi rank, my wife was near the buses, some feet from the explosion. "It was my wife who saved our lives. I wanted to go in earlier, but she said 'let's wait for [my cousin and De Graafschap player] Nathan Kabasele's girlfriend,' who was taking the same flight. "She told me that she was arriving in a minute or two. We miraculously survived. "Then I ran towards my wife, and to the Sheraton and towards the rear parking. I left my seven suitcases where they were. "A taximan followed me with three cases, the other four were brought to my house on Wednesday." Mbokani previously represented Belgian clubs Anderlecht and Standard Liege, and was travelling for two Africa Cup of Nations qualification matches over the next seven days. He continued: "There was even an Anderlecht supporter who, despite a serious wound on his knee, came to find me to tell me what a great fan of mine he was. That touched me."